Sentence diagramming was one of my favorite things to do as a kid. That sounds geeky, but I think the reason I liked it is because it helped me better understand the purpose of each element of the sentence. I also LOVE teaching sentence diagramming to my kids. I think it’s a one of those “lost arts” in education, like cursive writing. When we began our homeschool journey I made sure that our grammar/language arts included sentence diagramming. I wanted to know that my kids were putting into practice all they were learning when it came to the parts of a sentence. In full disclosure, I received free access to this program and was compensated for my time. in no way does this way my opinion. Lean with Diagrams is a new program (to us) we were recently introduced to. I absolutely adore how it marries two of my loves: technology (computer based) and grammar. Keep on reading for a inside look! What is Learn with Diagrams? 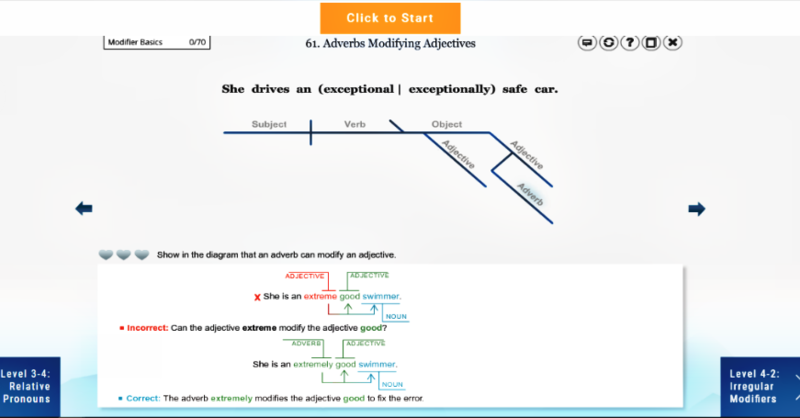 Learn with Diagrams is an online course that uses game-like lessons (or modules) to make learning sentence diagramming FUN. I have to say, I’m one of those parents who doesn’t care about making learning fun, but I’m all for including it in my kids curriculum if it’s a legit, well designed program. And let me tell you, Learn with Diagrams IS just that! 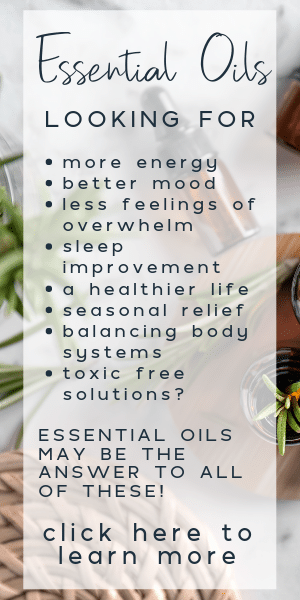 Check out their homeschool section for more details! Your student will first read through the written lesson. Sometimes there is also a video below this written portion, further explain and demonstrating the lesson. Next, your student will go through the exercises for that lesson. I like that you can click on the different blanks in the diagram, the parts of the senescence, and it has a window that will define what it is. 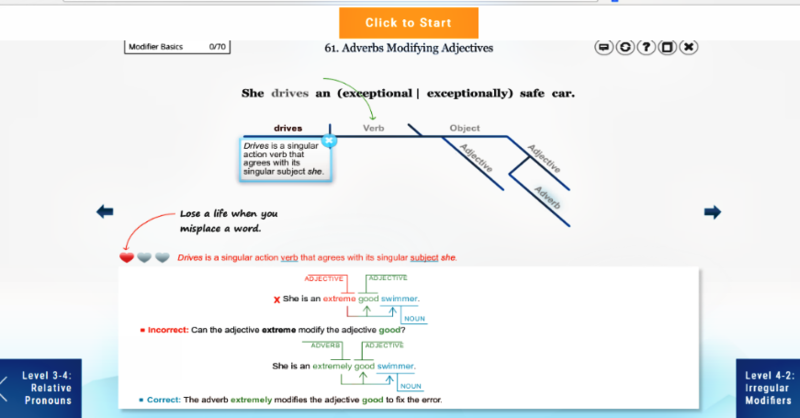 For example below is showing what an ADVERB is. And if you place a word where it doesn’t go, you’ll get a mark on those hearts. Also, if you click on the words from the sentence, it explains what the word is. You can see both of these in the image below. If they get an answer wrong, the exercise explains it to your kiddo – as to WHY their answer is incorrect, and then it will tell them what the correct answer is. You know what’s cool? The lessons adapt to your kids skill level. So this means that students of all ages (they suggest 5th grade and up) can use this program. My 9th grader used this and she was not only able to polish up on some skills, but also learned a few things! Check out their demo here. Ready to get it? I have a sweet discount for you! 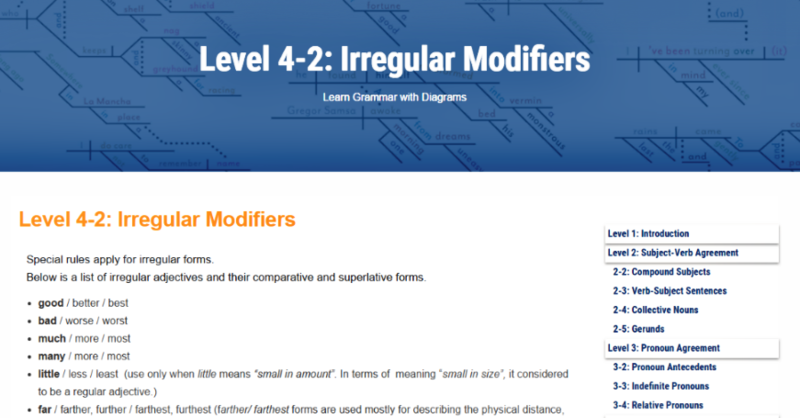 Sign up for a year’s subscription at Learn with Diagrams. It’s only 19$. Yup, that’s right! Something this stinkin’ awesome at such a great price! BUT WAIT! If you use the coupon code Grammargame you will get 10$ off your first year. So yea, that first year is ONLY 9$. Seriously, go sign up! You’ll love it! Find Lean with Diagrams on Twitter, Instagram, Facebook, and YouTube! Thank you for the discount code! I’m signed up and can’t wait to get started with my three girls!